Australia has come a long way since implementing the Disability Discrimination Act of 1992. It’s objective, to ensure that access to building premises extends out to those with disability. You may notice the infrastructure of ramps and elevator lifts an alternative to stairs in buildings for residential living, retail, factories, sports stadiums, schools, universities, hospitals and aged care facilities. The biggest issue with buildings of this nature is the problem faced by those who are unable to use the stairs to exit the building during a life-threatening emergency evacuation. We see occurrences of building fires around the world as a result of flammable cladding being used. Australian authorities seem to have little idea as to the number of buildings Australia has which may contain such cladding. The most recent cladding fire, the Grenfell Tower in the UK which took at least 80 lives. To make matters worse, buildings shorter than 25 meters are not required by law to have a sprinkler system. Combine this with flammable cladding and you have a real recipe for disaster. People in wheelchairs or those with limited mobility may find it difficult to evacuate such buildings where stairs are present. Lifts are also considered extremely dangerous to use as the wells which hold the lifts are not fire rated. All work places should have a PEEP (Personal Emergency Evacuation Plan) in place outlining their ‘escape plan’ specific to those who are unable to evacuate safely by themselves from the building. The designated fire warden on site should be aware of anyone with a disability and consult them personally about their specific requirements. Doing so may provide some insight as to a more effective evacuation plan. Fire isolated areas or ‘Safe Refuges’ should also be identified. Some stair wells are fire rated to allow for a temporary refuge until emergency response arrive but every emergency is different and extreme caution is advised. Some stair wells are not fire rated and can be deadly if used as a refuge point. Contacting your local emergency personnel is highly recommended. They are highly trained in situations like this and can provide extra assistance should it be known in advance. Lifting a person down the stairs is not recommended. Tripping or falling can easily occur resulting in injury to all those involved. Wheelchair users or those with limited mobility may benefit from the use of evacuation chairs or rescue sheets. With proper assistance, a person can be safely, quickly and comfortably evacuated from a building when stairs and other obstacles are present. 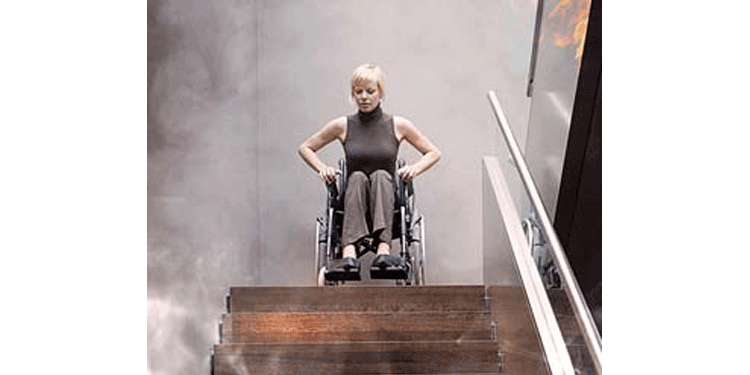 Evacuations Chairs are single-user operated and work using a dual track system that help to guide the chair down the stairs for a smooth and controlled decent. When the chair is on level ground, the four wheels are engaged and the chair can be pushed similar to that of a transit wheelchair. If another flight of stairs is present, the operator need only to manoeuvre the chair forward onto the next top two steps to begin the next controlled decent. A second assistant may be useful to open doors or remove obstacles ahead. The main benefit to using an evacuation chair is the speed at which a person with limited mobility is able to be evacuated from a life-threatening situation such as a building fire. With proper training, both person and assistant can familiarise themselves with the chair’s operation should a real-life emergency occur. When not in use, the chair should be kept close to the exit it serves. It simply folds up and can be leant against the wall or hung up using hooks – these are often provided by the manufacturer. Rescue Sheets or Evacuation Sliders offer a cost-effective alternative to the chairs. They’re quick to deploy and require minimal training to operate. With one assistant at the front and another at the rear, a person with limited mobility can be evacuated from a building where narrow hallways and stairs are present. The foam padding provides excellent support and comfort with varying mattress sizes available from small to bariatric. Evacusafe are UK manufacturers of world renown evacuation aids. Their quality and reputation has lent themselves to global recognition. In fact, the world’s tallest building in Dubai the Burj Khalifa Tower uses Evacusafe as a safety measure.